A vintage-style printed thangka of H.H. Kyabje Zong Rinpoche as the central figure, with Vajrayogini on the left and Dharma Protector Dorje Shugden on the right. This thangka is an excellent meditational aid and focal object for offerings to the lineage Gurus, Yidam and Protector. A vintage-style printed thangka of H.H. 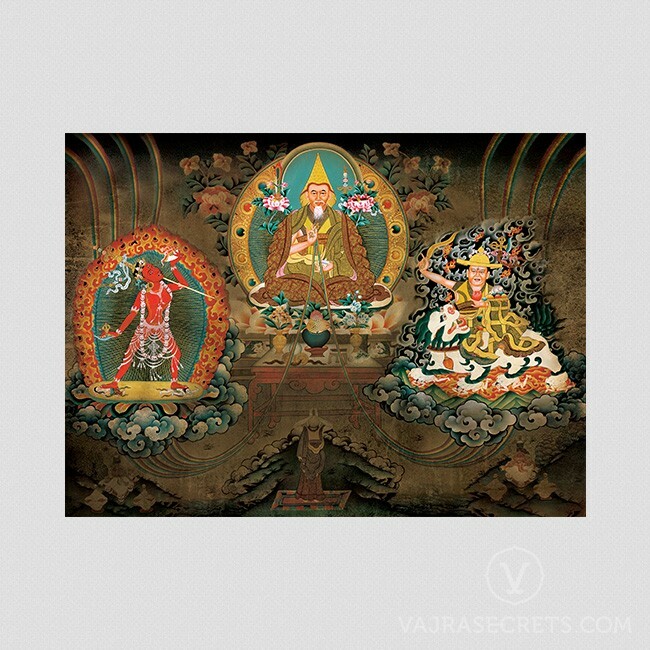 Kyabje Zong Rinpoche as the central figure, with Vajrayogini on the left and Dharma Protector Dorje Shugden on the right, perfect for those seeking a unique interpretation of the Guru, Yidam and Protector. Zong Rinpoche (top center): Kyabje Zong Rinpoche (1905 – 1984) was a powerful Tantric practitioner renowned for his legendary scholastic achievements, debating prowess and mastery of the most difficult rituals. This highly accomplished spiritual master was the Abbot of Gaden Shartse Monastery from 1937-1946, and is the root guru of H.E. Tsem Rinpoche. Vajrayogini (bottom left): Tantric Buddha Vajrayogini is depicted here in Naro Kacho form. Her image calms our immediate environment, grants protection and swiftly increases merits, wealth, attainments and general harmony. Dorje Shugden (bottom right): The wrathful emanation of the Buddha of Wisdom, Manjushri, Dorje Shugden grants powerful protection from negative energies and black magic, swiftly helps overcome life’s obstacles, and attracts the positive energies of wealth, peace and wisdom. This thangka is an excellent meditational aid and focal object for offerings to the lineage Gurus, Yidam and Protector. Highly recommended as a gift, a pièce de résistance or as a part of a vintage thangka collection.